Really, how hard can a Hulk movie be? A guy gets angry, turns green and insanely strong, smashes the thing that made him angry, and then runs away from the government. Throw in something that’ll give the Jade Giant a challenge (given that he’s the strongest hero in the Marvel Universe, this may prove difficult) and maybe a love interest for puny Banner, and you’ve got a 2 hour movie. To their credit, the people behind The Incredible Hulk seem to get all that. The Hulk kicks the crap out of some military dudes, then fights something as big and as ugly as he is, and then runs away. This new popcorn flick is an fun little diversion, a perfectly enjoyable way to pass 2 hours on a hot summer day, and a worthy second entry in Marvel’s budding film empire. Unfortunately, despite all that I’m still waiting for a satisfying Hulk movie. Allusions to the old TV show and comic are done perfectly and add quite a bit of humor. There’s a great bit that comics fans will recognize as a reference to James Kochalka’s Hulk vs. the Rain story (scroll down to the end of the page and click the thumbnails). The Samuel Sterns character is set up about as well as you can set up a villain no one’s heard of. The fights are awesome, even if it felt like they de-powered ol’ Purple Pants a bit too much. The computer graphics aren’t near as bad as the trailers would have you believe. In fact, in a lot of instances they are quite good. They work hard to establish a Hulk-Betty connection, even if it’s given short shrift. For all the in fighting, threats of lawsuits, and general bitchiness that came through the press, Edward Norton seems to get Bruce Banner. He gets that Banner is tortured by the Hulk, and that he’s constantly afraid of losing control and hurting people. Enough of that. Being too nice makes me all itchy and splotchy. The plot is moved along by happenstance. Bruce Banner is trying to cure himself of the Hulk, but is in hiding while he does. You get the feeling he’d have been content to stay in South America, had not a random accident called the Bad General’s attention to him. 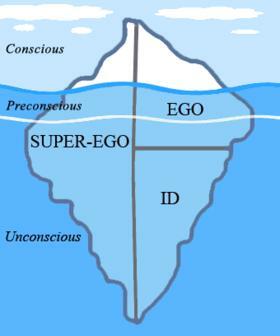 I prefer plots that drive themselves and aren’t content to let fate take them where they need to go. Tim Roth as a hardened, hardass soldier just doesn’t work, particularly when he takes his shirt off. I get that part of the allure of the actor is that he’s older and less fit than he should be and therefore susceptible to the offer to improve himself through chemistry. Unfortunately, his stature just doesn’t fit the Hollywood ideal of what an experienced, combat-tested fighting machine should look like. Sure the Hulk speaks, but he only says 5 words (yes, I counted) and this speaks to a fundamental flaw in the Mr. Hyde aspect of the character. The Hulk is not devoid of a personality, nor is he some wild animal that growls and roars all the time. The Hulk from the comics speaks in broken English and has the mind of a child (of course this has changed many times over the years, so I’m talking about the version of the Hulk most are familiar with). He wants to be left alone, and can’t understand why that can’t happen. He hates the “puny humans,” and despises “puny Banner” most of all. We get none of this in the movie. 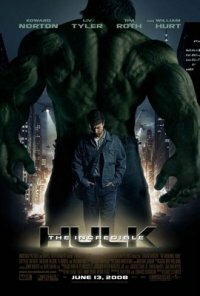 Would it have killed Zak Penn/Edward Norton/whoever you want to credit the script to to throw in a “Hulk strongest there is!” or a “Why Army men hurt Hulk?” The Hulk is a character too (the title character, for pity’s sake! ), so why does he keep getting the short end of the characterization stick? Are we afraid to get to know a being that is driven by pure, unadulterated, righteous fury? 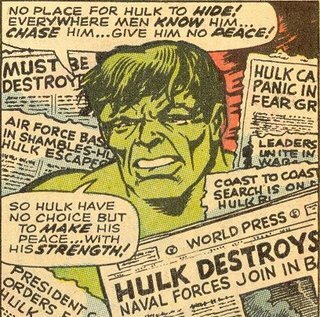 The Hulk is our id run amok, and this should appeal to all of us on some level. Someone’s bothering you, so you beat them senseless. A loved one is in danger, so you protect them through brute force. Americans, as a general rule, love solving problems through violence so why can’t we humanize the embodiment of this tendency? Hopefully this movie does well enough to merit a sequel so the filmmakers have the opportunity to explore these questions. I feel as though I’ll soon delve into nit-picking mode, so allow me to wrap things up. Director Louis Leterrier and company have given us a serviceable, enjoyable, and appropriately loud summer movie that succeeds where its predecessor failed. While it doesn’t bring anything new to dinner or have the sense of fun and whimsy Iron Man brought to theaters, it re-treads familiar ground in a way that should please audiences. This entry was posted on June 17, 2008 at 10:04 am and is filed under Uncategorized. You can follow any responses to this entry through the RSS 2.0 feed. You can leave a response, or trackback from your own site. When did he say “Betty?” I was sure he’d say her name some time and therefore listening for it, but I completely missed it. Now I feel cheated.